"The unity of God may be defined as follows: 'God is not divided into parts, yet we see different attributes of God emphasized at different times'. This attribute of God has also been called "God's simplicity', using simple in the less common sense of 'not complex' or 'not composed of parts'. But since the word 'simple' today has the more common sense of 'easy to understand' and 'unintelligent or foolish,' it is more helpful now to speak of God's 'unity' rather than his 'simplicity'. (Wayne Grudem, Systematic Theology, page 177). "When scripture speaks about God's attributes it never singles out one attribute of God as more important than all the rest. There is an assumption that every attribute is completely true of God and is true of all of God's character." (Wayne Grudem, Systematic Theology, page 178). "For God Himself is His own nature. Therefore, in the same way, God is God, and He is this God." The doctrine of Divine Simplicity, when allied with the doctrine of the Trinity, expresses not just any bare monotheism (such as found in Islam or some expressions of Judaism), but the specific, Trinitarian monotheism revealed in the Biblical text. Today's post will aim to show how the Biblical doctrine of the Trinity is compatible with the doctrine of Divine simplicity. Whenever we speak of the doctrine of the Trinity, we are transitioning from discussing "what God is" as One God to the particular identity of this God. In sum then, the doctrine of the Trinity tells us "who God is", while the doctrine of Divine Simplicity tells us "what God is". Whenever we doctrinally and practically consider the Biblical revelation of God as "one in being and three in Personhood", we can use both these doctrines to approach the Biblical revelation about God. b. Plurality of Personhood = that is, the Father, Son and Holy Spirit sharing the Divinely simple nature. c. The co-equality of the Persons = that is, Father, Son and Spirit are equal in glory, eternity and power in their sharing the Divinely simple nature. "The Lord our God is but one only living and true God; whose subsistence is in and of himself, infinite in being and perfection; whose essence cannot be comprehended by any but himself; a most pure spirit, invisible, without body, parts, or passions, who only hath immortality, dwelling in the light which no man can approach unto....". The doctrine of the Trinity affirms that God is One God. When explaining this first plank to people, I like to use the phrase "compound unity" to segue into what would be the "second plank", which speaks to plurality of persons. When I say "compound", I'm speaking of the Persons of the Trinity. The term "unity" refers to the simple essence itself. 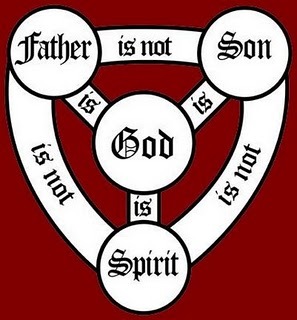 Hence, the doctrine of the Trinity presents God as a compound (with respect to the members of the Godhead) unity (with respect to the essence). God is plural in Person while one in essence. We must not conceive of the Divine essence as a "fourth" thing, such as an inert cloud, set along side the Three Persons. The next post will explore this second plank in further detail and how the three Persons and the Divine essence are inextricably bound as One God who is Father, Son and Spirit. For now it is worth noting that with respect to Biblical monotheism, especially the full-orbed revelation of the doctrine in the New Testament, the Three Persons of the Trinity are the living relationship and communion that so defines the Divine essence of God. The simple essence of God resides in, among and through the Three Persons. If there were no Father, Son and Spirit, there would be no God.The doctrine of Divine Simplicity asserts that God, with respect to His essence or being, is uncompounded. With that said, the doctrine of Divine Simplicity does not conflict nor preclude the plurality of identity or personhood that we see when we speak of the Father, Son and Holy Spirit (Genesis 1:26; Deuteronomy 32; Proverbs 30:4; Isaiah 48; Matthew 28:19; 2 Corinthians 13:14). Why? Simplicity speaks to God's divine existence (i.e. 'how God is God') and essence (i.e. "what God is as God'). However, the doctrine of Divine simplicity does not touch upon God's identity (i.e. "who God is as God"). The identity of the Triune Persons reveal a "compound" or "plurality" to the identity of God. As we have stressed in this post, both doctrines partner together to expound the Biblical testimony of what God is and who He is. The second "plank", plurality of personhood, will be the focus of the next post.